The bottle: I think I’ve already gone on long enough about how much I appreciate the look of Bach Brewing’s super summery beer labels in my review of this Auckland brewery’s delicious Beachstone Pilsner, a beer that I adored. Like they might say in Thailand or Vietnam, the label on my 500ml bottle of Driftwood session pale ale is same same but different. 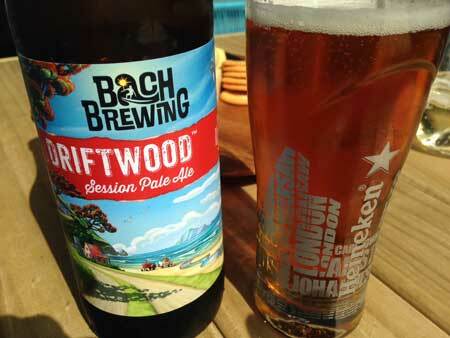 Blurb on the bottle: Bach Brewing is a family owned gypsy brewing company located between the shores of Auckland’s harbours. Our passion is brewing fresh aromatic beer that compliments [sic] our coastal way of living. Driftwood SPA features locally grown Riwaka hops from Nelson and Gladfield malts from Canterbury. Their tasting notes (from the Bach Brewing website): Fresh stone fruit, grapefruit and honeyed malt characters, this pale ale is an easy drinking pleasure. Tastes like: The textbook definition of a sessionable pale ale – relatively light and easy to drink, not too complex but with just enough character so you don’t get bored with it. If I’m going to be picky (frankly, you have to be picky when you’re reviewing a beer for the whole world to read), perhaps it was a tad more watery than I would have liked. Otherwise, I enjoyed this beer’s fruity, hop-forward aroma, even if it was much mellower to the taste than it was to the smell (what you expect from a session pale ale). It poured a rich amber colour, though I would have been happy to drink it from the bottle; I really do love the look of these craft beers by Bach Brewing. Is it the best beer ever? It’s not Bach Brewing’s Beachstone Pilsner, so no. That beer was awesome, while this beer, the Driftwood session pale ale, is merely good. Perhaps even very good – for a session pale ale. Like it says on the bottle, this beer is an easy drinking pleasure. If you’re looking for something more complex than that, look elsewhere. While you’re here, check out my review of Liberty Brewing’s Oh Brother session pale ale.